A Hurricane Hunter aircraft has noted a surface wind of 42 knots. Because of this were staying with 50 mph as a reasonable estimate of sustained surface winds. The pressure has dropped 3 mb, indicating that we are about to see the next strengthening phase. Deep convection near the surface low as well as strong banding support this also. We will likely see a stronger Alex by tomorrow morning and Alex may be a hurricane by later Tuesday. At 10 pm edt / 9 pm cdt Alex was centered at 20.6° N / 91.6° W or about 525 miles southeast of Brownsville, Texas. It is moving little. Top sustained winds 50 mph (60 mph NHC). Pressure is 987 mb. All interests in northeastern Mexico and Texas should follow Alex closely. Make final preparations by Tuesday afternoon if you live on the south Texas or northern Mexican coast. Alex is a large system and is slowly, but surely organizing. Deep convection is building around the center of circulation and an eyewall is starting to form. Spiral banding is also remaining intact far from the center of circulation. Alex is still on pace to become a hurricane later today. The hurricane hunter found unimpressive surface winds last night, but with a 73 knot flight level wind and a pressure now down to 985 mb, stronger surface winds surely exist. We are going to estimate a little under NHC's 70 mph. It looks like the northerly motion has shifted some with a jog more to the west recently. This has been anticipated. 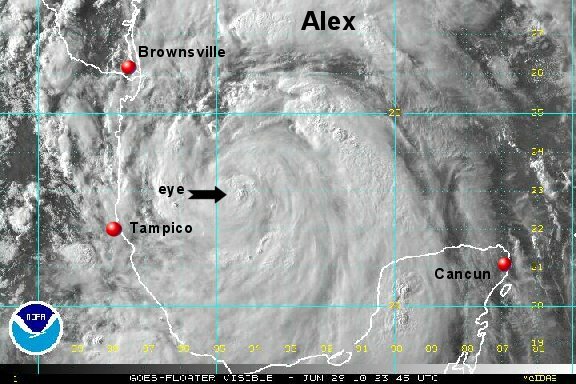 At 7 am edt / 6 am cdt Alex was centered at 21.7° N / 92.0° W or about 455 miles southeast of Brownsville, Texas. It is moving nw at 8 mph. Top sustained winds 65 mph (70 mph NHC). Pressure is 984 mb. Forecast models from last night are more clustered again with a landfall on the northeastern Mexico coast late Wednesday. A strong high pressure center over the Rockies is shifting east to the Mississippi Valley. This ridge will block Alex from getting too far north. Even if Alex makes a landfall in northern Mexico, spiral bands will affect Texas with heavy rain and some wind and tidal rises depending on its strength. All interests in northeastern Mexico and south Texas should follow Alex closely. Make final preparations by late this afternoon if you live on the south Texas or northern Mexican coast. It's best not to wait until tomorrow. The latest hurricane hunter has indicated a surface wind of 49 knots and 70 knots flight level. The pressure is still slowly dropping now at 982 mb. The pressure is just about at what is usually considered minimal hurricane strength. With the surface winds still lagging of what would be expected from a 982 mb low, we are still estimating top sustained winds of 65 mph. The temporary slow down with Alex is over and it is speeding up and moving northwest again. It is very likely with the eyewall trying to organize that the hurricane center will surely classify this as a hurricane sometime this afternoon. 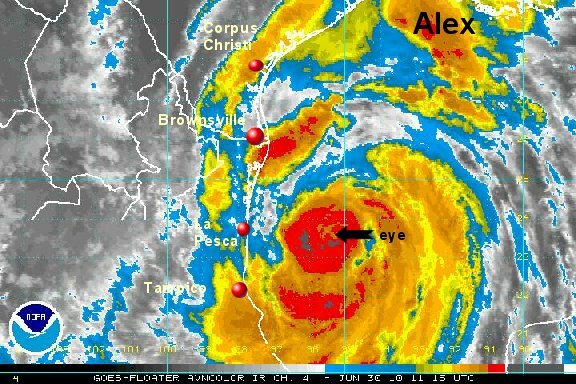 At 11 am edt / 10 am cdt Alex was centered at 22.7° N / 93.1° W or about 355 miles southeast of Brownsville, Texas. It is moving nw at 12 mph. Top sustained winds 65 mph (70 mph NHC). Pressure is 982 mb. Alex has a spiraled appearance with the eyewall almost ready to close off. Once this happens more significant strengthening may occur. 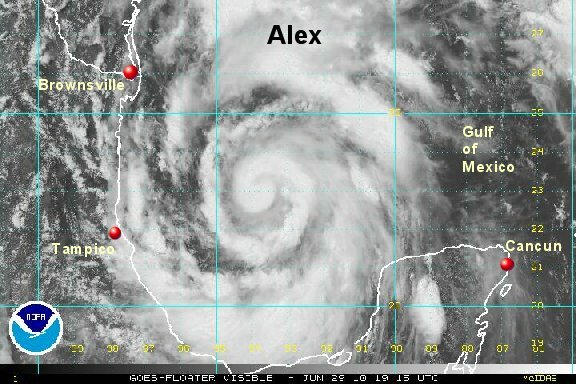 The hurricane center and we believe that Alex will be a hurricane shortly. At 5 pm edt / 4 pm cdt Alex was centered at 23.2° N / 94.0° W or about 290 miles southeast of Brownsville, Texas. It is moving nw at 12 mph. Top sustained winds 70 mph (70 mph NHC). Pressure is 981 mb. Heavy rainfall and tropical storm force winds will affect the southern coast of Texas later tonight into Wednesday. Forecast models continue to take Alex inland in northeastern mexico by tomorrow late afternoon / evening. All interests in northeastern Mexico and south Texas should follow Alex closely. Finish preparations by this evening. Alex has closed off its eyewall and pressure has dropped rapidly. NHC will call this a hurricane on the next official advisory or sooner. The latest recon confirms an eye center now south of due west indicating a motion to the west. Significant strengthening is now likely overnight into wednesday. At 9 pm edt / 8 pm cdt Alex was centered at 23.0° N / 94.4° W or about 275 miles southeast of Brownsville, Texas. It is moving just south of due west at 12 mph. Top sustained winds 75 mph (70 mph NHC). Pressure is 973 mb. Heavy rainfall and tropical storm force winds will affect the southern coast of Texas later tonight into Wednesday. The brunt of this (hurricane) will move into northeastern Mexico with south Texas receiving some squalls. As expected, the hurricane center now has Alex a hurricane at 75 mph to agree with our estimate earlier. Alex has slowly down overnight and has strengthened slightly. It is also curious to see a discrepancy in the pressure and reported surface winds. For 24 hours now surface winds have been under what would be expected for a given pressure. The pressure for Alex is now down to 959 mb. The last recon reported a surface wind of 58 knots or about 67 mph. The flight level wind was reported at 82 knots or about 94 mph. Our surface wind estimate ( and NHC's ) is higher than what has been found so far at the surface giving respect to the low 959 pressure. It is possible that the winds are indeed lighter at the surface, but with the eyewall looking stronger recently on satellite, it is probably more prudent to go with a good compromise of the 80 mph wind. The latest Brownsville radar and observation indicated heavy rain with winds gusting near 30 mph - a little under tropical storm force. Seas offshore with Alex are in excess of 20 feet east of the mexico coast. 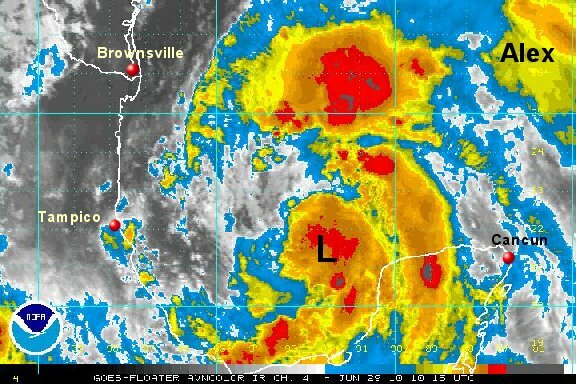 At 8 am edt / 7 am cdt Alex was centered at 23.4° N / 95.3° W or about 220 miles southeast of Brownsville, Texas / 155 miles east of La Pesca, Mexico It is moving west northwest at 7 mph. Top sustained winds 80 mph (80 mph NHC). Pressure is 959 mb. Heavy rainfall and tropical storm force winds will affect the southern coast of Texas today and tonight. The brunt of this Alex will move into northeastern Mexico with south Texas receiving some squalls. Forecast models take Alex inland in northeastern mexico by very late this evening. All interests in northeastern Mexico and south Texas should follow Alex closely. 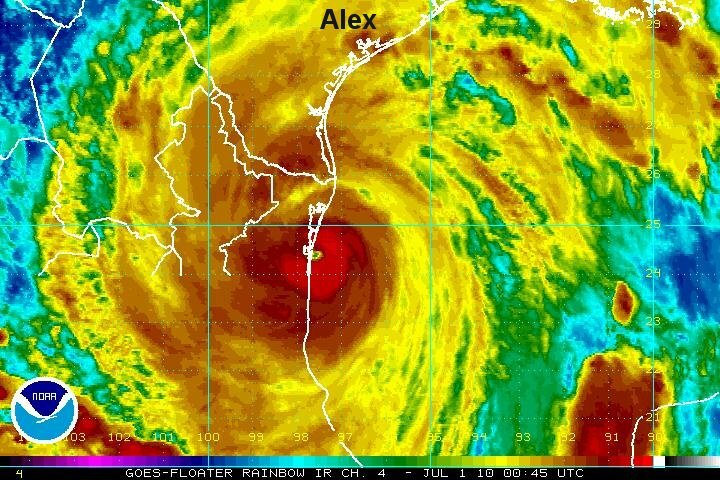 Alex at first look has the appearance of a severe hurricane. Overall large in size, but wthl a very small core of hurricane winds that stretch roughly 25 miles north and south of the eye center. 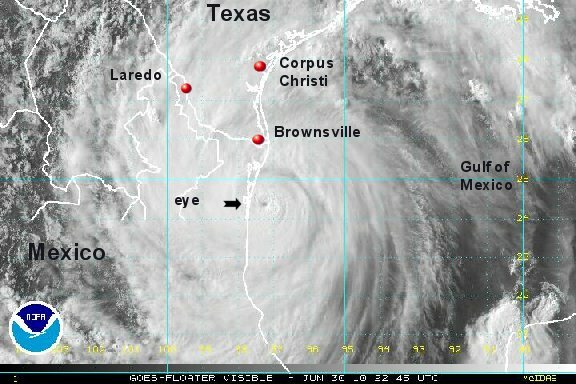 Alex is going to make landfall late this evening about 50-75 miles south of Brownsville, Texas. The worst of the wind damage from Alex will be in this small range where landfall occurs. Surface winds finally are reflecting what the pressure should indicate. A surface wind of 84 mph was seen from the hurricane hunter about 1-2 hours ago. With the eye becoming more defined, winds are increasing and may be 95-100 mph by the evening. 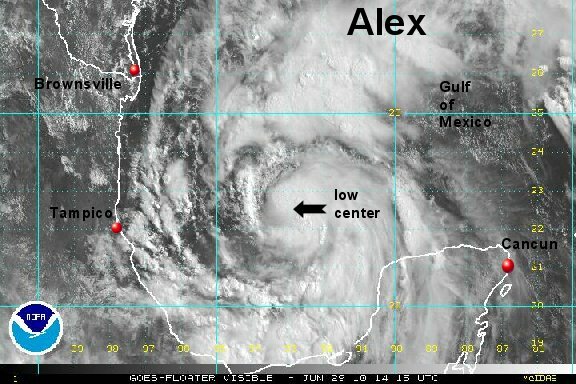 At 3 pm edt / 2 pm cdt Alex was centered at 24.5° N / 96.5° W or about 115 miles south southeast of Brownsville, Texas. It is moving west northwest at 7 mph. Top sustained winds 90 mph (85 mph NHC). Pressure is 961 mb. Doppler radar has estimated 6-8" of rainfall so far near Brownsville, Texas. Winds are gusting near or just under tropical storm strength (30-40 mph) in south Texas. NHC upped winds to 90 mph to agree with our assessment on their last advisory. The latest radar shows that the eye is just offshore and will be making landfall by the next 3-4 four hours from now. We are optimistic that Texas will not see hurricane force winds. A recon reported a 955 pressure recently, so the winds are probably up to 95-100 mph now....a minimal cat 2. The strengthening will not last long and will stop as the eye crosses land. A hurricane hunter recon confirmed that the rapid strengthening phase is still occuring with the pressure dropping rapidly. Thankfully the strengthening will be stopped within the next couple of hours as the eyewall crosses land. A western shift of motion recently is taking Alex about 25 miles farther south than the original landfall estimate. 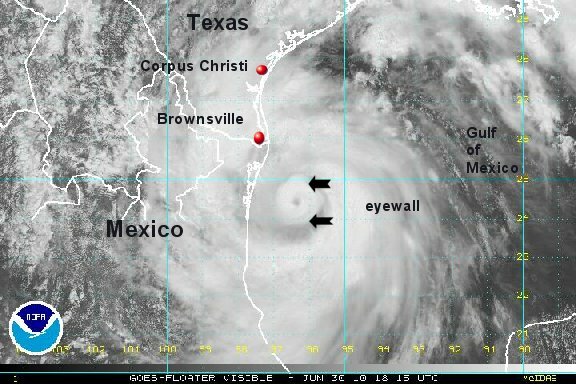 Landfall will be about 100 miles south of Brownsville. Doppler radar has rainfall totals estimated at 6-9 inches across a large section of south Texas and northeastern Mexico. Flash flooding remains a high concern. So far Brownsville has reported a wind gust to 47 mph. Winds may have gusted a little higher near the coast. Winds over tropical storm strength will continue tonight, but we remain optimistic that the hurricane force winds will remain in northeastern Mexico. At 8 pm edt / 7 pm cdt Alex was centered at 24.4° N / 97.3° W or about 105 miles south of Brownsville, Texas. It is moving west at 12 mph. Top sustained winds 105 mph (100 mph NHC). Pressure is 950 mb. Newest recon pressure 948 mb. Surface from hurricane hunter recon 94 mph / flight level wind (5 k feet) of 123 mph. Alex is now on the coast of Mexico. Hurricane force winds are confined to between 15-60 miles from the eye. The eyewall is not exactly circular, so this is the reason for the distance difference from the center of the eye. Hurricane winds will not be felt in Texas. 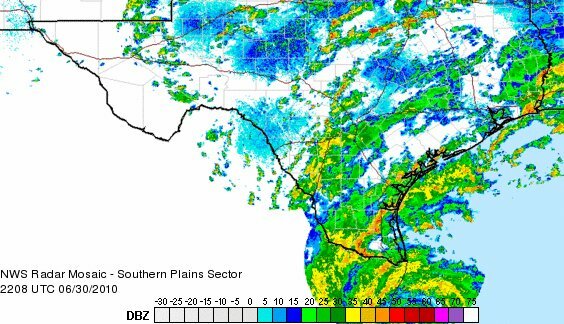 Widespread heavy rain continues in south Texas and northeastern Mexico with doppler radar estimates of now over 11 inches. Flash flooding concerns remain high. 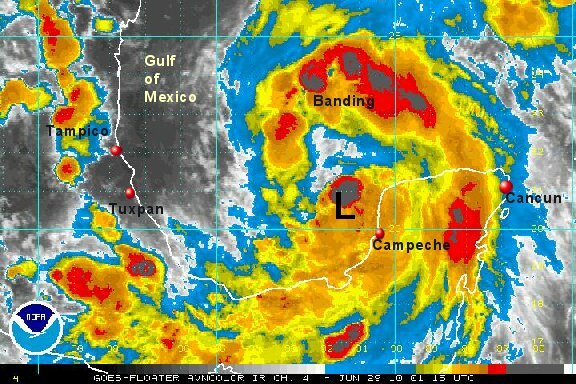 At 10 pm edt / 9 pm cdt Alex was centered at 24.3° N / 97.7° W or about 110 miles south of Brownsville, Texas or near San Jose de Los Leones, Mexico. It is moving a little south of west at 10 mph. Top sustained winds 105 mph (100 mph NHC). Pressure is 947 mb. Alex is now heading into the high mountains of central Mexico. It has turned and is now moving west southwest instead of westerly. It is heading in the general direction of Puerto Vallarta - on the west coast of Mexico. It is doubtful that any of the circulation will be intact once it is over water again off of the coast. Brownsville and McAllen, Texas both had rainfall records yesterday. Brownsville had about 6 1/4" and McAllen a little less than 7 1/4". Doppler rainfall totals were over 11 inches in the area. Flash flooding is still a concern today in south Texas as well as northern Mexico with additional rain occuring. 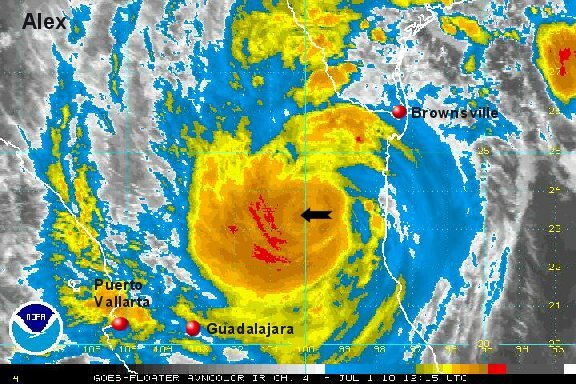 At 9 am edt / 8 am cdt Alex was centered at 22.3° N / 100.2° W or near Villa Juarez, Mexico. It is moving southwest at about 14 mph. Top sustained winds 55 mph (70 mph NHC last advisory). Pressure is 977 mb. Alex's circulation is getting greatly disrupted over the mountains of central mexico. Heavy rain continues over Texas and central Mexcio. This will be the last update on Alex.